April Cleaning Company specialises in the waterfed pole system of window cleaning. This system is now considered the Industry standard for cleaning windows as it greatly reduces the risks associated with ladders. We clean up to 65 feet (6 floors) by using carbon fibre telescopic poles with soft brushes attached that spray 100% pure water onto the windows. The pure water attracts dirt and impurities before being rinsed away, the windows are then left to dry to a spotless finish. The benefits of this system are numerous, clients save money on the fitting and maintenance of ladder eyebolts and ties as well as the hiring of expensive access equipment. Previously inaccessible windows can now be reached with operatives working safely from ground level. 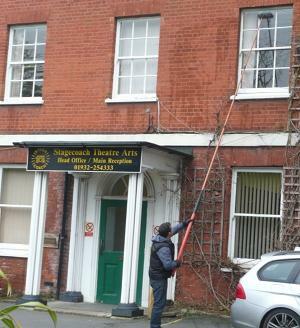 This type of window cleaning is also environmentally friendly as no chemicals are ever used. In general we find that this type of window cleaning minimises damage and creates far less disturbance to the occupants of buildings than other methods.